Aaron Powell has been named Vice President for UW Information Technology (UW-IT) and Chief Information Officer, effective immediately. The appointment was announced by UW Executive Vice President for Finance and Administration Jeffrey Scott on Thursday, November 16, 2017, after a six-month national search. 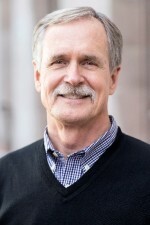 Powell has been serving as the interim VP for UW-IT and CIO for the past year. “Aaron’s proven leadership and ability to build strong partnerships across the University will ensure his success in his new position,” Scott said. As Vice President and CIO, Aaron will report directly to the Executive Vice President for Finance and Administration, and continue to provide strategic leadership in delivering world-class information technology support to the University and in helping to guide the UW’s administrative modernization efforts. Aaron previously served as UW Information Technology’s Associate Vice President for Information Management where he was responsible for leading the UW’s core administrative systems and Enterprise Information Management efforts. Aaron came to the University in 2014 with more than 20 years of leadership and management experience, including as Director of Computing and Communications for The Evergreen State College and Chief of Information Systems for the State Department of Social and Health Services. He is a highly respected leader with a strong statewide reputation.